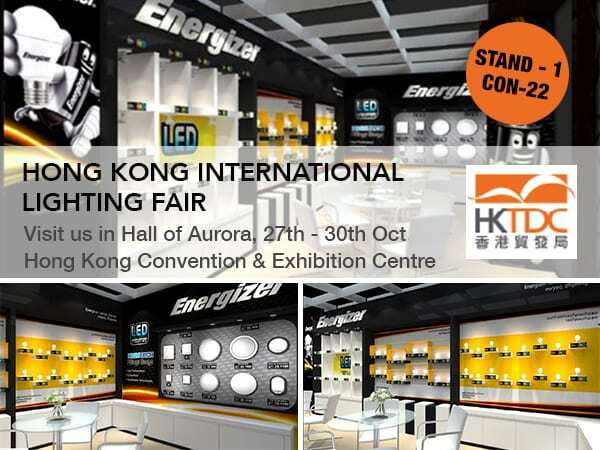 Hong Kong International Lighting Fair is expecting Cira 70,000 buyers from all across the globe. The Fair is a must-attend event in the global lighting trade calendar with its all-inclusive offerings and prime opportunity to measure market sentiment and catch up on the latest lighting trends. International Sales Manager Scott Kenna, Senior Product Manager David Neilson, and Fitting Product Manager Stephen Pickering will be exhibiting. Previous buyers from several countries recorded double-digit growth, including India, Iran, Brazil, the United Arab Emirates, the Chinese mainland, Spain, Russia, Taiwan, Italy and France. Among emerging markets, the industry is most interested in expanding business in the Chinese mainland (24%), ASEAN (17%) and the Middle East (7%). Creative design is leading the way in LED lighting product development, as reflected by the fair’s premium zone, Hall of Aurora. Energizer showcased its latest LED lighting products in an elegant brand-new stand. Click here for a sneak peak of the Event, why not Follow us on LinkedIn to keep up to date.